Launchpad couldn't import bug #13416 from freedesktop.org Bugzilla. Launchpad couldn't import bug #466678 from Red Hat Bugzilla. This might be related to the mentioned freedesktop bug, but since there was no response in 4 months, I thought that filing it here as well might be a good idea. 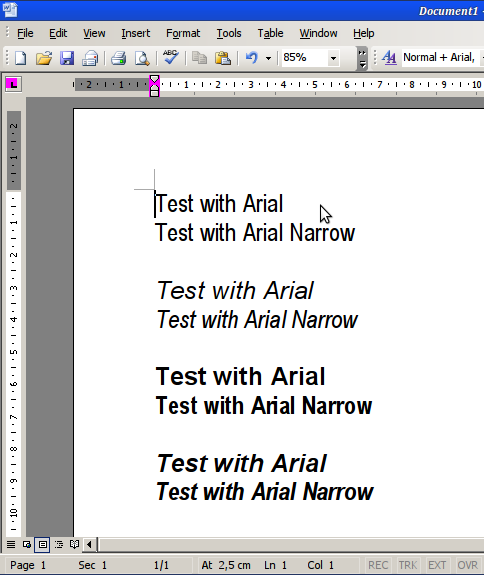 I can confirm that neither Ubuntu 9.10 nor OpenOffice.org 3.1 recognize the Arial Narrow font family properly. OpenOffice.org provides a way to install fonts through spadmin, which are not available to the system. After realizing that Arial Narrow was not usable in my Ubuntu system, I tried spadmin to install it directly into OpenOffice.org to no avail. 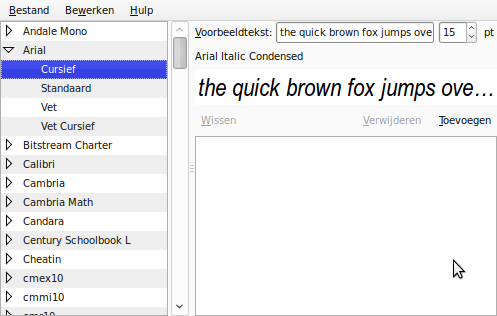 It is recognized as Arial font family, Narrow style by the Gnome Font Viewer, which is interesting, to put it softly, because there is no "Narrow" style in ANY program I know which uses fonts. There are only Regular, Bold, Italic, and combinations of these. In OpenOffice.org, the spadmin is supposed to allow the renaming of fonts. I can see the duplicate entries for Arial, which are actually Arial Narrow fonts, and I can rename them, but it always reverts back, never sticks. So, that doesn't work as advertised, either. I understand your argument that heuristics is bound to miserably fail at some point, but why providing a way to work around broken fonts would be bad? It might delay fixing of fonts, but given that the spec was requested by font authors, I would assume that the ones that cared already did their job. Believing that all fonts will eventually be fixed is unrealistic. The bug is also present in Lucid. Seeing this too, on Ubuntu 10.04. Very annoying! I'm unable to reproduce this issue in Karmic, Lucid and Maverick, even with dutch locales (if I recognized dutch well). 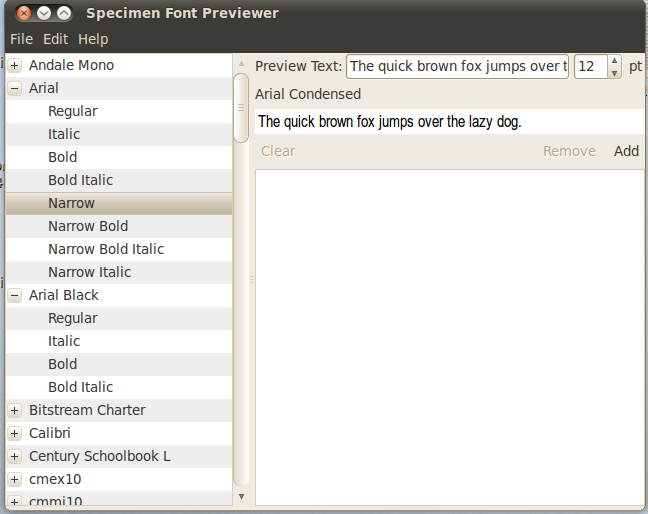 gnome-specimen lists 2 different fonts (which are the right ones) and the right fonts are used in openoffice. I suspect some kind of substitution occurs on you system. Confirmed in updated lucid and maverick on multiple systems. This debian-derived bug has appeared in Ubuntu on multiple occasions repeatedly. Unforunately the earlier bug reports seem to have been deleted or closed. The problem is that arial Narrow is a *DIFFERENT* font and is mistakenly assigned to arial. It should show up as separate font as does "Arial Black". See attached screen print. 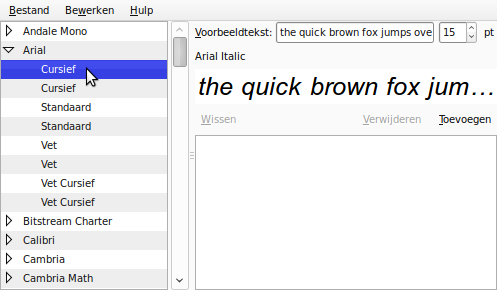 Arial narrow is a very common font and the inability to use this font in Ubuntu is one of the main reasons that I run MS office in Vbox. The commands give similar output here. Installing in ~/.fonts makes no difference. I had the same problem. Give a try to older TTF files from XP instead of W7. Change 'Arial' to 'Arial Narrow' and 'Narrow' to 'Regular'. Click OK and select File -> Generate Fonts... (don't click on 'Save...', it won't work) and select 'True Type' from the box under the filename. Click on the wrench icon on the upper right corner and select 'Show Hidden Files', then save it in .fonts folder. You can replace the original file or save it under different name, it should work anyway. FontForge will tell you that the font has errors, but ignore it. Now do the same with ARIALNB.TFF, ARIALNBI.TFF and ARIALNI.TFF, of course changing 'Narrow' to 'Bold', 'Bold Italic' and 'Italic' respectively. It appears to be working fine on my Lucid. Solution proposed by Amarok worked for me too, thanks a lot!